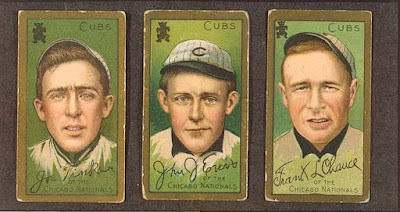 Joe Tinker, Johnny Evers, and Frank Chance were the shortstop, second baseman, and first baseman/manager respectively of the Cubs back in their "glory days" of the early 20th Century when they dominated the league, won 4 pennants in 5 years and 2 consecutive World Series. Statistically speaking, they didn't turn an extraordinary amount of double-plays, and none of them had Hall of Fame numbers. Frank Chance as a manager might have. Nonetheless, they were certainly famous, and the Hall of Fame inducted all three of them 1946. Why write a poem about them? Adams was a columnist and sports writer for the Giants who had spent 5 years falling just short of the Cubs in the standings (most famously in 1908). They were their nemesis, if you will. Maybe the poem brought some luck, as the Giants would win 3 consecutive pennants from 1911-1913.